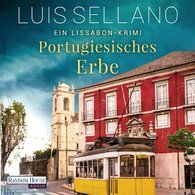 Luis Sellano is the pseudonym of a German writer. Although stockfish has never been his favourite food, Luis Sellano loves pastéis de nata and vinho verde all the more. He fell hopelessly in love with Lisbon on his very first visit to the city on the Tejo and regularly makes for the Iberian Peninsula, its scenery and the people living there and enjoys its culinary delights.